My life’s musical notes as it sways. To remove the patches of unheard pains. Pained memories to a lifelong gain. My mercy pleas to sorrows in denial dies.. The windchime’s tunes holds me aloft and high..
Hope is what my windchime never loses..
And the hope itself becomes "The Music of Silence". The intricate web of detail u've spun is so very beautiful. That was amazing sweetie!What a lovely piece of poetry and wonderful choice of words,each word telling a story. i felt these lines after reading your poem dear....hope you like them...!!! The words are gentle yet strong to ponder over. something awesome can be played with ur words only preeti :)...each sentence has a specific meaninig not only for the white chime for the life to ..:)..
it was a lovely piece of writing..
wow, seven sticks playing seven sounds just like the octave-repeating scale! i so loved the third stanza. 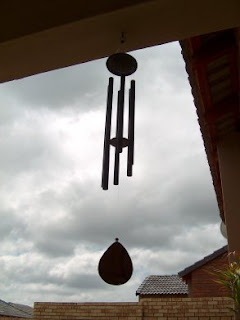 how i wish to experience the magic of the wind chime! how does it feel when its raining and all you hear is the splash of rain drops and the musical notes of the chime? man, i am already loving it :) you sure have a wonderful white window! loved the post! wow,, i am speeeeeeech less!! one thing is sure.. that when u get lonely u just love to stay near your window dho? varah nice..
thanks dadimum. so very happy that u loved it. i really do not knw wat to reply against ur such a beautiful comment. in words i cud never xplain how much i have loved ur poem. it's so so soooooooo beautiful. it brought tears to me. glad that my white window is able to bring happiness n smiles in ur life. thank you so much yamini. thank you so much CU. kamon accho?? onek din pore ele je? thanks a lot hemu dear. so very glad that u hv loved d poem so much n thnx for ur kind words. wowwww that would be simply magical sawan. glad that u loved my poem and thanks for such a beautiful comment. ya janu being ur soul sis even i feel the same abt this poem. so very happy that u loved it. thanks a lot. yes i love to near my window not only wen m lonely but other times also. it's so magical. thanks a lor dear. glad that u loved reading it. 2 more days to go! all set to welcome the new year? A good song of hope. Esp the last lines speaks dimensions of your abilities- one dreams of such an ending. You have done that. Keep composing more and more such poems. So just try to make the pattern consistent in every stanza. wind chimes r such amazing things..
a resultful new year, Preety!